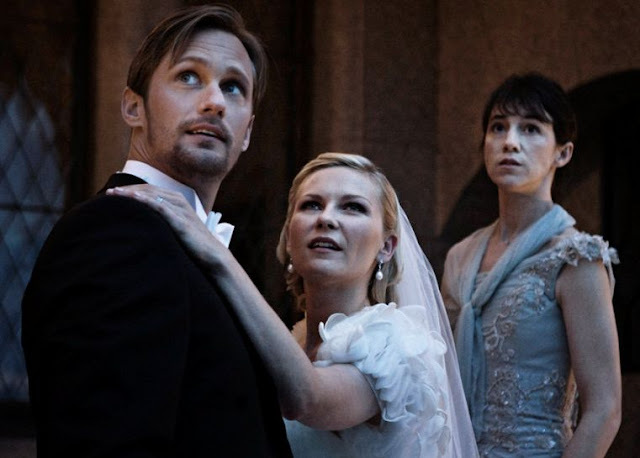 Unfortunately, Melancholia is known as “The Lars von Trier Nazi comments film,” after the misguided remarks the director made at last summer’s Cannes film festival. It’s unfortunate, too, because it’s his best film in years. Billed as a “Beautiful movie about the end of the world,” Melancholia is exhausting and intimate, a psychological drama under the guise of a disaster flick. Kirsten Dunst, who won best actress at Cannes for her performance, plays Justine, who is estranged from her sister Claire, played by Charlotte Gainsbourg. Alexander Skarsgard, making a departure from the dangerous men he’s embodied as of late, plays Michael, who’s set to marry Justine. All the while, a rogue planet is on a collision course with Earth. The film finally opens in New York this weekend. We recently caught up with Dunst, Gainsbourg, and Skarsgard, who traveled deep into the land of von Trier and lived to tell about it. Kirsten Dunst: For me, I just got an email that was like, read this script. Lars wants to talk to you tomorrow and he’s really interested in your for this movie. I know that two directors had recommended me because it was supposed to be Penelope Cruz in the film at first. So two friends of his mentioned me for the role, and we barely even talked about the script. We just talked about The Night Porter and Charlotte Rampling. It was really simple for me. Did you have any reservations about working with Lars? A lot changes from the page to the screen took place. Did you have any idea how massive the film would actually be? KD: I know it’s a Lars film. I didn’t think, stylistically, how it would look until we were getting to these homes. 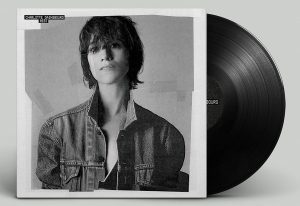 Charlotte Gainsbourg: Visually, I didn’t even see it as being America or that castle. It was his atmosphere. How does working with Lars differ from working with other filmmakers? Alex Skarsgard: It’s very unconventional and it was such an interesting vibe and atmosphere. We all kind of lived together in the middle of nowhere in southern Sweden. Usually, when you work, it’s like you block a scene and then you have tape marks and then you have a master. Then you show up and the director’s like, “Alright! Let’s see what happens.” But Lars doesn’t care about continuity and he wants to be surprised. He wants to be like, “Oh, that was interesting, I didn’t expect that to happen.” You do whatever you want and then he’ll come in and he knows. You feel like he’s editing it in his head as he’s watching it, and then if there’s something he needs, he’ll come in and whisper something. It was really one of the most amazing experiences of my career. Did you rehearse before you shot the film? AS: He shoots it as we rehearse, and it’s usually a disaster. There were these big scenes with cars coming and going, and he’s like, “Alright, let’s shoot!” and we’re like, “What’s my cue? When do I drive?” But I get it, because there are these moments that will happen. Most of it will be a disaster, but then something will happen in that rehearsal, some little moment or something awkward or something that’s real, and you won’t be able to recreate that. He’ll be there with a camera and he’ll capture that, and then you’ll do it again and fix what didn’t work, but then you’ll have these little moments you can put in. CG: He tries to push you a bit off of your grounds and it’s very helpful. Now I find it’s very difficult to work in a different way because you feel so free. Now when someone says, “Okay, we’re going to rehearse,” and you’re feeling that you’re missing stuff, it’s very difficult. With a film so heavy, did you have to keep the atmosphere light on set in order to not fully sink into your own depression? AS: That’s the thing, we partied weekends and had fun because you need that. You can’t spend two months in that darkness. KD: Everyone was always cooking or we’d meet for a meal. Charlotte, how was the experience on Melancholia different than Antichrist? CG: Antichrist felt so intimate, with a tiny crew who went to extremes. And with this character everything was more subtle and more difficult for me to understand, and to know where I was going because it was less extreme. And the crew felt different, the whole thing was nearly the opposite which was nice. I was nervous before I started this film because I enjoyed myself so much on the first, that I was worried it wouldn’t be as good. I enjoyed Antichrist very much in a troubled way. That’s why we do this job, not to go in easy places. Was Lars a different director or person while working on this film opposed to Antichrist? CG: Very different. I think he was not well when we shot Antichrist and came up saying he didn’t know if he’d be able to finish the film. And so we suffered looking at him and not being able to cope with everything. For this, he was good and was saying how happy he felt. So that was nice to see him recover. It seems like even though Lars has some of the most challenging roles for women, people seem to misconstrue them as misogynistic, which is crazy, no? KD: He’s one of the only people writing roles and women are the leads. CG: But there is a cruelty and a darkness and that’s what makes a character. How did you feel when you saw the completed film for the first time? AS: It’s always weird when you watch yourself, especially the first time, because you’re always critical. I wasn’t able to go to Cannes, so I went back to Sweden in May, and it was in theaters then, or in June, and I thought it was amazing. KD: The sound was crazy at the end. I laughed at Cannes. I turned to my friend and was like, “What is going on?” Not because I thought it was funny, but because it was so intense. I thought it was amazing. I thought the end was so cool when I saw it done for the first time. I haven’t seen an ending in a theater like that, and it is so unexpected because it’s so intimate. Did Lars give you any advice when going into the film? CG: He asked us to watch Persona. KD: And he told me to watch Philadelphia Story. I think because it takes place at a wedding and it’s charming and funny, and he didn’t want to lose that essence even though it was a film about depression. KD: I’d be sad if I never had kids and it was the end of the world. If it was the end of the world tomorrow, I’d probably just be with my friends or something. CG: I just want it to be quick and not know about it.